Before you get in touch with me then please read this. This page explains who we are and how these pages are built. That page also leads to another page on how you can contact us more efficiently. 10:44 - Merry Christmas to you all! Finished adding both Ships hit by U-boats in WWII (3336 maps) and WWI (3946 maps). This is a stop-gap until I finish a better solution I am working on. I have just re-activated the U-boat fates maps for all U-boats, see U-2511 for example. They are now static (fixed image) so no zoom is available for now. Working on re-adding the maps to Ships attacked, WWI U-boat fates and Allied Warships. On 16 July Google Maps increased their prices for the dynamic maps we use on the site 15-fold. I am working on solving this problem since we use the maps heavily all over the site. In the mean time I might have to disable some major map section. We have learned that KrvKpt. 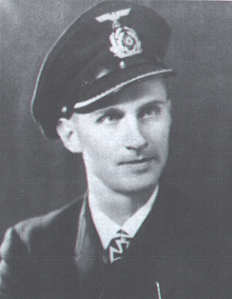 Reinhard Hardegen (former commander of U-123, of Operation Drumbeat fame) has passed away on 9 June 2018 at the age of 105. The wreck of the type XXI U-boat U-3523 has been located in 400 feet off the danish island of Skagen, slightly west of the estimated sinking location. She joins many other discovered U-boat wrecks post-war. A danish source with nice illustrations and scans showing the boat on embedded in the sea floor. Modified movie title Hitler's Lost Sub. Improved the map of ships hit by the most successful U-boats. We only have A-Z (26) markers labels and the map had a problem if asked for more than that (ships would be missing on map). Now ships after the 26th are shown with a plain marker. See successes of U-107 for example. 43 hits by only 26 names labels, now all 43 are visible and working. This affects about 20 most successful boats. This will be improved further soon. Made big changes to our maps. 3 of them now show allied ships sunk in the area in question. Check out those example: Caribbean, US East Coast and the Barents Sea/Arctic. Scroll to the bottom of each page. Hope you like it! Modified movie title Enemy Below, The. Improved the convoy route maps quite a bit. Now all the ships on that route hit are shown in colour by year. See the heavily attacked route HX for example. Convoy maps now show labels (A-Z) matching the list of ships above, see HX-79. Added the WWI U-boat Commander search into the WWI sidebar, it was too difficult to find before. Made it a lot faster and it also shows each man's U-boat command. 08:37 - New server has been launched! On Tuesday night, Sep 26, we launched our new server and all the work associated with that project. No visible changes to the site at this time but we're much better and should be faster as well. Modified movie title Haie und Kleine Fische. Added 1,170 people on Allied Ships hit by U-boats in WWII. We now have 88,011 people in that database. 11:11 - New WWI wreck found? Yahoo News is reporting that a Type IIB U-boat from WWI has been found largely intact with 23 crew members still on board. We don't know if this is really a new wreck find or something we knew already about since there is no location given. But if a new discovery if might be one of UB 27, UB 29 or UB 32 which have not been located as far as we know. See our map of WWI U-boats discovered since their loss. Over the last two days photos of 269 Allied Commanders have been added to their profiles. We now have 664 profile photos of those men. Most of those photos have been submitted by our readers, often relatives of the commanders, and we're most grateful for that. Modified movie title U-234: Hitler's Last U-Boat. In preparation of a wider overhaul a rewrite of the code behind the site is underway. Following that a new server will be launched and then an overhaul of the layout of the site, making it more mobile friendly for example. Added 1,530 people on Allied Ships hit by U-boats in WWII. We now have 86,758 people in that database. Brian has been busy adding Wartime histories on the Allied Warship section. Now 250 warships have such histories, the last one added was the US Battleship USS Iowa, also the first not for a submarine. 249 of these wartime histories are submarines of the Royal Navy (165), United States Navy (50), Dutch Navy (32) and Norwegian Navy (2). The warship section also includes over 40,000 notes displayed on relevant warships. The wrekc of U-581, sunk on 2 February 1942 in the North Atlantic south-east of Horta, Azores, has been located See more on our forums. Added 2,241 people on Allied Ships hit by U-boats in WWII. We now have 85,085 people in that database. 19:05 - Happy New Year! Happy New Year from us here at uboat.net! Hopefully lots of updates and changes coming this year :). The server farm we're on had a problem yesterday (Saturday) and the machine has been acting strangely since. We're looking into the problem and the site might act oddly (or disappear from time to time) until we solve this. Edit: We seem to have solved this. Check out this amazing footage of the wreck of U-576, lost with all hands in 1942 off Cape Hatteras on her 5th war patrol. Added 1,259 people on Allied Ships hit by U-boats in WWII. We now have 82,621 people in that database. Check out the Archive for previous months!